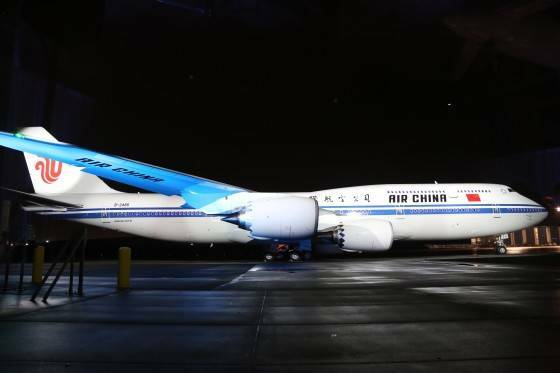 In the evening of September 29 in Seattle, Beijing time, Air China and Boeing held a grand aircraft delivery ceremony in Seattle , the United States , marking the official delivery of China’s first B747-8 to Air China. The type is a member of the latest generation B747 family. It will arrive at Beijing Capital International Airport on October 1 , Beijing time, China’s National Day, and will join Air China’s fleet in October. This new B747 type is more efficient, quieter and more environmentally friendly, and will become one of the leading wide-body types on Air China’s international long-haul routes. Song Zhiyong, Air China President, Zhang Hongying, Director General of the Department of Aircraft Airworthiness Certification of CAAC, John Wojick, Senior VP, Global Sales & Marketing of Boeing, representatives from the corporate customers of Air China’s North American offices, and journalists from mainstream media of China and the United States attended the ceremony. Joseph F. Sutter ., B747’s 93-year-old legendary designer, was also present at the ceremony. Known as the “Father of B747”, Joseph spoke in glowing terms of Air China, saying the carrier will score greater successes in the world’s airline industry in the future. In addition, Air China also invited some of its employees who had lot of experiences with the B747 type to attend the ceremony – they are father and son who are both pilots, mentor and “disciple” who are both flight attendants, and co-workers who are both maintenance engineers, attracting a lot of attention on the site. B747 is a legendary long-range wide-body type. Air China once operated B747 family aircraft including 747-SP, 747COM and 747-400 All-Passenger. The B747 family aircraft have been the carrier’s leading wide-body type on international routes and main domestic routes in the past 20 years, and have been playing an important role in helping Air China expand its international route network. The type holds powerful appeal for passengers thanks to its unique double-deck design, reliability and amenities, and thus has acquired enviable reputation in the industry. The fuselage of Air China’s newly delivered B747-8 long-range wide-body jetliner measures 76.4 meters long, 5.5 meters longer than that of B747-400. It has a capacity of 467 passengers and a range of up to 14,815 kilometers (8000 nautical miles). Using more electronics and automation technologies, the jetliner is a showcase of digitalized features. The new cockpit tools help improve flight efficiency and safety. The new navigation system, which gets onboard the B747 type for the first time, helps pilots choose better flight paths and guarantees smooth takeoff and landing under adverse conditions. It uses some of B787-8 Dreamliner’s high technologies, boasts more efficient engines and wing design than the existing B747 family aircraft, and impresses with its operational reliability and smooth flight. It’s 16% more fuel efficient than B747-400, produces lower emissions, uses new noise reduction technologies, is 30% quieter than B747-400, and is more environmentally friendly. To offer more pleasant travel experiences for passengers, Air China uses its well-conceived new cabin interior decor to adorn its first B747-8. The new cabin interior decor is the brainchild of Han Meilin, a highly celebrated Chinese artist who was the designer of Air China’s corporate logo. The patterns, which depict three traditional Chinese cultural elements—beautiful clouds, pottery pieces and auspicious phoenix – blend in perfectly with the posh cabin environment. The three elements represent heaven, earth and flight, conveying the message that the heaven, the land and man are in perfect harmony in a peaceful and happy world. The interior decor is intended to expose passengers to Chinese culture once they step into the cabin. In addition, Air China’s B747-8 is configured with a four-class layout – First Class, Business Class, Premium Economy Class and Economy Class – for the first time. The First Class and Business Class are outfitted with ergonomically designed seats which can turn into full-flat beds, while the Premium Economy Class offers bigger seat pitch with legroom that is 120% of that in standard Economy Class. The whole cabin is outfitted with power outlets and personal entertainment system, offering a variety of AVOD options. Onboard, there is more space; the baggage compartments are bigger and easier to open and close, meeting the needs of passengers on long-haul flights. The streamlined gracefully curving cabin wall, high ceiling and new lighting system further enhance the sense of space. Air China President Song Zhiyong indicated that B747 has a fascinating story to tell about the history of the development of Air China and even the Chinese civil aviation industry. B747 is the world’s first transoceanic long-range wide-body type, a milestone in the history of the world’s civil aviation. Since its introduction into China’s civil aviation industry in 1980, it has witnessed many momentous events including the start of direct flights between China and the United States , China’s successful bid for the Olympics, the first Chinese flight over the Arctic, and the first Chinese biofuel trial flight. As Air China’s leading wide-body type, it’s also been an important part of Air China’s endeavor to evolve into one of the world-class airlines. The newly delivered B747-8 will undoubtedly further boost Air China’s global route network, offering passengers worldwide more pleasant travel experiences. Air China is ready to continue that fascinating story with Boeing and serve the traveling public wholeheartedly. By June 2014, Air China had a fleet of 512 aircraft of Boeing and Airbus families (including those operated by the companies Air China has a stake in). These aircraft are 6.22 years old on average, which gives Air China a reasonable fleet structure featuring both long-range and medium-range aircraft. Air China boasts China’s largest wide-body fleet. It operates 323 passenger routes, serving 162 cities in 32 countries (regions). Relying on the route network of the Star Alliance, Air China can fly passengers to 1328 destinations in 195 countries. On September 26 , Air China just took delivery of its 20 th B777-300ER, a type very popular with business travelers. By the end of 2015 Air China will have taken delivery of 7 B747-8s, which will further cement Air China’s long-range route network alongside its B777-300ER fleet and largest Airbus 330 fleet of China , offering more travel options to passengers worldwide. It has been reported that after the B747-8 joins Air China’s fleet, it will be put into service in domestic market on October 11 , then by the end of this year, the airplane will be introduced into such international routes as Beijing – Frankfurt and Beijing – Los Angeles.